​What do we see when we look at the portraits? The 44th president is seen sitting on a wooden armchair that seems to be floating amid a scrim of dense foliage and flowers in an image by Kehinde Wiley. The first lady, painted against a robin’s egg blue background, rests her chin on one hand and stares at the viewer with a curious mix of confidence and vulnerability in a canvas by Amy Sherald. What story or message does the portrait convey? A swelling vein on the left side of the president’s face, and the intensity of his gaze, suggest the “doesn’t suffer fools gladly” impatience that occasionally flashed from him. How does the background shape what the portrait is about? Wiley has included flowers in the background (another nod to historical portraiture) to reference elements of the president’s personal history, including jasmine for Hawaii, African blue lilies for his father’s Kenyan heritage, and chrysanthemums, which are the official flower of Chicago. Curiously, the president’s left foot is poised just over a bunch of African blue lilies, as though he’s about to crush them. How does where the viewer looks first and second shape what the portrait is about? Sherald has depicted Michelle Obama in a dress by Michelle Smith’s Milly label, tasteful but not extravagant department-store fashion that recalls the first lady’s mix of couture and comfortable pragmatism. Sherald was attracted by the large, geometric patterns of the fabric, which recalls the style of Mondrian. But it is the bulk of the dress that makes a statement, all but engulfing the body, with little more than the face, arms and hands (with light violet-colored nail polish) exposed. The dress forms a pyramid, with the face atop, in a way that suggests a protective carapace, hiding from view the first lady’s body and some of her femininity, which were targets of racist attack during her tenure in the East Wing. How does the background shape what the portraits are about? The contrast of the artists’ renderings of the backgrounds is also compelling. The first lady inhabits a world of calm, clarity and Wedgwood-hued enlightenment, while the president is seen untethered against a screen of leaves and flowers, with occasional glimpses into an unknown, dark space beyond. 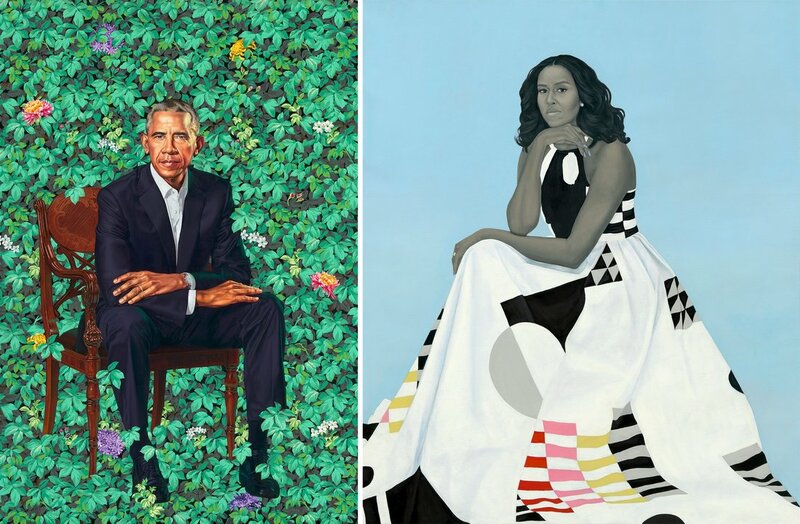 So one of them seems grounded while the other is up for grabs, while some of the femininity hidden within the folds of the first lady’s dress has magically reappeared in the refulgent floral world of the president’s portrait.